I've been reviewing lots of iPod accessories for the holiday season. 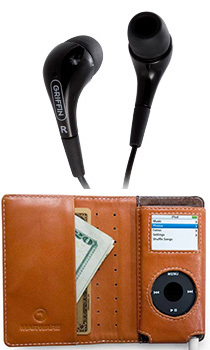 But the two that I'll be keeping for my nano are the Griffin EarThumps and the Marware CEO Card Wallet. You can read my reviews of the EarThumps and the Card Wallet for more details. But the bottom line is that both of these accessories are affordable, stylish, and very functional. I had a difficult time finding a nano case I liked until I tested the Marware Card Wallet. And the EarThumps are much more comfortable than the standard iPod earbuds... and sound great too -- especially if you like bass.